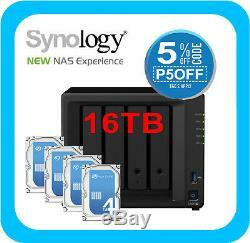 Powerful and scalable 4-bay NAS for growing businesses. 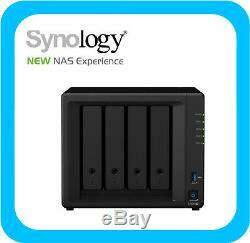 Synology DS918+ is designed for small and medium-sized businesses and IT enthusiasts. With a powerful built-in AES-NI hardware encryption engine, DS918+ provides exceptional encrypted file transmission. Also capable of transcoding up to two channels of H. 264 4K videos at the same time, DS918+ is ideal for sharing and storing ultra-high definition media content. Satisfy your need for performance and capacity. DS918+ supports up to two M. 2 NVMe 2280 SSDs, allowing fast system cache creation without occupying internal drive bays. Scalable up to 9 drives with a Synology Expansion Unit DX517, DS918+ answers the need for flexible storage capacity. Btrfs: Next generation storage efficiency. Btrfs file system introduces the most advanced storage technologies to meet the management needs of modern large scale businesses. Flexible Shared Folder/User Quota System provides comprehensive quota control on all user accounts and shared folders. Snapshot Replication provides schedulable and storage capacity-saving data protection with 1,024 shared folder backups and 65,000 system-wide snapshots. File or folder level data restoration makes data recovery fast and flexible. Automatic file self-healing detects and recovers corrupted files without user intervention. Powered by Synology DiskStation Manager (DSM), Synology NAS offers advanced security measures to protect against sudden data loss and potential security holes. Analyzes system settings, password strength, network preferences, and removes any possible malware. A kernel-level enhancement that blocks malicious programs from accessing unauthorized system resources. Encrypt shared folders and network data transmission to keep data from unauthorized access. Prevent others from logging in to your DSM by generating a one-time password (OTP) on your mobile device. Customize the trust level in Package Center to avoid installing packages from untrusted sources, safeguarding your NAS from unknown or tampered package files. Synchronize files across your devices. Cloud Station Suite provides real-time data synchronization across all your devices, such as computers, mobile devices, and other Synology NAS whenever a file is modified. "Intelliversioning" keeps the most important file versions to better utilize storage space. Access and stream your 4K media content anytime and anywhere. 265 online transcoding via Video Station and DS video, allowing 4K videos to be converted and played on the fly on other computers, smartphones, and media players that originally do not support Ultra HD formats. 2 NVMe SSD slot (bottom side). 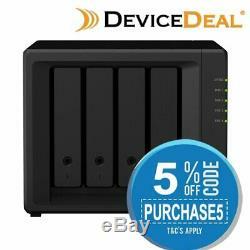 The item "Synology DiskStation DS918+ 4 Bay Diskless NAS Quad Core CPU 4GB RAM + 16TB HDD" is in sale since Monday, December 12, 2016. This item is in the category "Computers/Tablets & Networking\Drives, Storage & Blank Media\Drive Enclosures & Docks". The seller is "device-deal" and is located in Melbnourne, Victoria. This item can be shipped to Australia, North, South, or Latin America, all countries in Europe, all countries in continental Asia, New Zealand.